A unique line of artisan chutneys and condiments from Le Bon Magot captures flavors of North Africa, Asia, and the Middle East. The spiced raisin marmalata is flavored with smoked cinnamon and ras al hanout, a spice blend with dried rose petals and cardamom, while the lemon-sultana marmalata has small golden raisins, caraway, and saffron. Sweet and sour brinjal caponata, with chunks of eggplant and curry leaves, is scented with cumin. White pumpkin and almond murabba, a preserve, is laced with cardamom and vanilla (8 ounces for $13 to $16). Owner Naomi Mobed was born in Karachi, raised in Tehran, and lived in Hong Kong as her father moved the family for his work. For years, she also traveled globally for her career in banking and finance and spent stints studying or working in London, Dubai, Cairo, Casablanca, and other cities. The dried fruits and exotic spices in souks and bazaars inspired her. “I absorbed the culture, food, and taste of all the places I lived,” says Mobed, who is now settled in Lawrenceville, N.J., where she produces the condiments in small batches using heirloom recipes. They are versatile and can be paired with cheese and charcuterie, spread onto breads and pita chips, or alongside grilled chicken and gamey meats. Available at Formaggio Kitchen, 268 Shawmut Ave., Boston, 617-350-6996, and 244 Huron Ave., Cambridge, 617-354-4750; Curds & Co., 288 Washington St., Brookline, 617-879-0565; the Cheese Shop of Salem, 45 Lafayette St., Salem, 978-498-4820, Whole Foods Market, selected locations, or go to www.lebonmagot.com. Here at 150ish, we often bemoan the state of our fridges and pantries—is there room to squeeze in just one more jar of some tasty spread or condiment that we’ve carried home from a market or specialty shop? 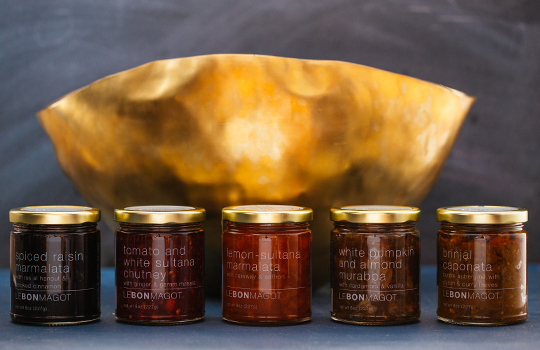 Francesca and Marisa will always save a spot for jars from Le Bon Magot, a line of chutneys and spreads created by Naomi Mobed and based on a palate developed the world over. We’re not the only ones to sing the praises of her surprising flavors—in 2017, she was awarded no less than five SOFI awards by the Specialty Food Association and was a Good Food award finalist as well. She repeated her SOFI success just last month, taking another gold at the Winter Fancy Food Show. Here’s the dish. Le Bon Magot roughly translates to “the hidden treasure,” and that’s an apt description of these tasty condiments. While the concept of sweet and sour chutneys, relishes, achars, and so-called “pickles” are inherent in her native South Asian culture and a presence at every meal, Naomi draws upon flavors she absorbed while living in such diverse destinations as Dubai, Johannesburg, and London. Her travels started early. Born in Karachi, Pakistan, her father’s oil-industry career quickly moved the family to Tehran, followed by stations in Hong Kong, Copenhagen, and Bartlesville, Oklahoma, before settling in Lawrenceville, New Jersey, when Naomi was in high school. “My parents were the type who quickly integrated the language and culture of wherever we were living into our family life,” Naomi tells us. “For example, when we moved to Hong Kong, the first thing my mother did was to enroll in a Szechuan culinary course, then she went and did Hong Kong cuisine. We always found it easy to assimilate to wherever we lived.” She explains that her mother became adept at recreating dishes from her own culture anywhere in the world, substituting local spices or flavors if an exact ingredient could not be found. Naomi quickly learned that the so-called “food boundaries” that define something as Indian, African, or Middle Eastern, can quickly be broken down. Naomi also tells us that both her grandmother and her mother play a large role in product development—her grandmother’s inherent knife skills and understanding of how to cut and chop different ingredients for optimum flavor greatly impacted the textures, while her mother works closely with her on flavor profiles. “There are a lot of hard-core battles that are fought at home when it comes to new flavors,” she laughs. Naomi is clearly ambitious for her brand, but it is obvious at first taste how much care and thought has gone into the contents of each jar—her use of local produce (Jersey tomatoes for the Tomato and White Sultana Chutney, with ginger and garam masala; Indian long gourds grown “right up the road” for the White Pumpkin and Almond Murabba, with cardamom and vanilla) means that every batch she makes is nuanced. She works closely with her North Fork of Long Island co-packers to make constant adjustments and achieve the right balance. In addition to the aforementioned chutney and murabba, there is Brinjal Caponata, featuring eggplant with cumin and curry leaves; Lemon-Sultana Marmalata, with caraway and saffron; and Spiced Raisin Marmalata, with ras al hanout and smoked cinnamon. Listen to Naomi describe how she elevates a sandwich and you get a great sense of the palate behind the products: “I love the spiced raisin marmalata with duck prosciutto—it’s gorgeous. Take mesclan greens lightly dressed with a good olive oil, balsamic, and fresh pepper, melting oozing Fontina cheese, and crisp ciabatta. I’m crazy for mustard, so with this, I would do just a hint of butter on the bread, then a very thin layer of mustard, and then build the sandwich with a healthy layer of the spiced raisin marmalata on top.” Is your mouth watering? Ours certainly was. Hearing Naomi describe new products in the pipeline also convinced us there’s no end to her creativity. She mentions a Serrano pepper and tamarind pickle with coriander seeds, and then a rose and rhubarb jelly, made with the extract of Long Island sea roses. There is also a spiced carrot marmalade with figs, dates, and sour cherries. From there she sees emulsions, ice creams, and snack products in the future. “What is challenging in this environment where people have so much choice is to build a brand and have people start to trust us with their pantry and grazing selections,” she says. We’ll follow Naomi down any aisle. For an extensive list of retailers, or to order directly, visit lebonmagot.com. Le Bon Magot features a number of great recipes on their website. We love this easy but very tasty hors d’oeuvre idea courtesy of Niloufer Mavalvala and Niloufer's Kitchen. One taste and you’ll see why the Tomato and White Sultana Chutney captured the Gold SOFI at last year’s Winter Fancy Food Show. Image courtesy Niloufer Mavalvala. Preheat the oven to 350°F. Cut the cauliflower into chunks and place in the work bowl of a food processor with 1 cup of the grated cheese. Pulse until the cauliflower pieces resemble kernels of rice. With the food processor still running, add the eggs and process until well-combined. Spray two 12-count mini muffin pans with nonstick cooking spray. Spoon the cauliflower and cheese mixture into each cup and press mixture to sides with a spoon to resemble a small cup. Bake for 25 minutes, or until the edges are golden brown. Remove from the oven and allow to cool for 1 to 2 minutes before loosening the edges with a butter knife. Place the cups on a serving platter and divide the remaining 1/2 cup of cheese into each cup. Top each with a small dollop of the chutney and serve immediately. Notes: Do not to over-process the cauliflower and cheese in the food processor. Be sure all edges of the cups are even when pressing them down with a spoon. The most common mistake at this step is to press the sides too much and the bottom not enough. This will result in overbrowning of the sides and an undercooked bottom. However, be sure to keep the bottom thick enough that you can easily remove the cups from the pan after baking.